Looking for the latest heating oil systems with the best energy efficiency ratings to save you money? We stock, install, service and repair heating systems, including furnaces, boilers and burners from major brands that will help you do it. Easy to install and maintain, the Burnham IQ Oil Boiler Control System makes this a leader in energy-efficiency, helping you to save money. This system is one of the most efficient and reliable boilers on the market, with an Annual Fuel Utilization Efficiency (AFUE) of 86%. 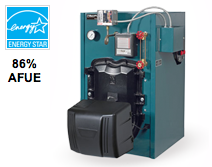 * The I=B=R Burner Capacity is based on oil having Higher Heating Value of 140,000 BTU/Gal. ** DOE Heating Capacity and Annual Fuel Utilization Efficiency (AFUE) are based on US Government tests at 13.0% CO2 with No. 1 maximum smoke and 0.00″ draft in the breach on standard equipment package. *** Net I=B=R Ratings are based upon pick-up allowance of 1.333. Consult manufacturer with unusual piping and pickup requirements before selecting boiler. * Tankless Heater Rating, GPM is based on 100° F temperature rise with 40° F inlet water (intermittent draw) with boiler water temperature of 190 F.
Radiant Heat provides even, consistent temperature throughout your home, eliminating costly and annoying hot and cold swings often associated with traditional heating systems. Wirsbo Radiant Heat offers more choice, comfort and convenience compared to traditional heating systems as the heating system is firmly established in the floor of your home. Contact us now to learn which of our heating systems is best for your home, to help you get the oil savings that you want and need.